Wow! again. Every month just seems to fly by now. Six months was the big half a year milestone. But eight? This feels like one year is just around the corner. This month has been even crazier in how much mobility we’ve gained. Last month you just started belly / army crawling. Then crawling on your hands & knees, and longer distances. When your barefoot you do and elephant walk on your hands & feet. And now you are pulling up to stand. And cruising on the ottoman or Monkey’s cage. Crawling is the fastest transportation and is FAST. You can get into trouble very quickly if we aren’t watching. Walking is the new black, you can’t get enough of it. I’m betting you will take your first steps by ten months. But with walking comes falling. If you don’t fall you won’t learn… You’ve taken a couple of bad spills, but usually a quick cuddle is all you need to be on your way. You are getting in to everything you shouldn’t. The cords under the desk, the vacuum, the trash/recycling, the rabbit’s food. You’re newest thing is dumping the hay box. We have to be fast to stop you, but we are at 3+ times a day. We are exploring new options. The pulling up necessitated lowering the crib, so you are halfway to a big boy bed. This also meant a reorganization of storage space. And I finally packed up and put away the bassinet. You know, the one that hasn’t been used since nine weeks. This month your bedtime has gotten much better but overnight sleep is hit or miss. We are working on getting back to waking up once around 4 or 5 and then 7 or 8. 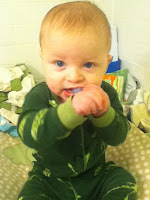 We get into a groove then teething or sick happens. We are co-sleeping the second half the night. It mostly works. I’ve been tired, so it’s nice not to have to get up. 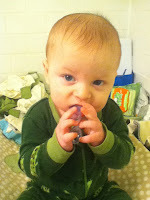 The better bedtime routine though, means that the nursery / office share is coming to an end. The desk will be moving out soon and the room will be all yours. Napping doesn’t always happen. But nap time does, some days it is called quiet time rather than napping. This is what I found when peeking in on you. Two bottom teeth, that’s it. I think a top one will come through soon. 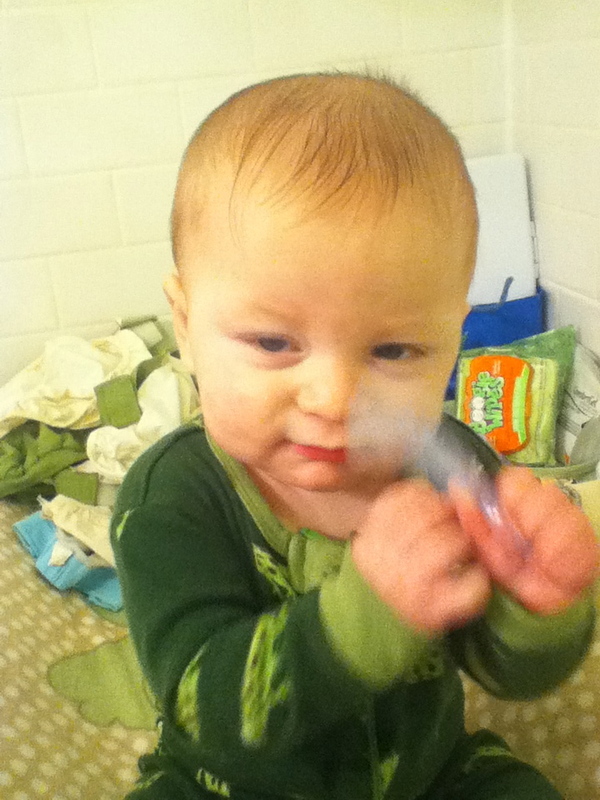 “Brushing” your teeth is a highlight of the bedtime routine. Food hasn’t changed much, you eat well at daycare and are getting better with bottles. You eat pretty much anything we give you. And the pincer grasp is coming along, so you are getting better at feeding yourself. No words yet, but lots of babbling. Mostly MaMaMa, but Da, Ba, and Pa make it in occasionally. I am still loving this stage. Even with the ninja like moving that is happening. And just for fun – this is what happens when the baby tries to be all wily and get around the barrier of toys. Totally deserved.